This Alfreda mixer tap is perfect for a single hole mounted tap in the kitchen, laundry or bathroom. Some people prefer the simplicity of separate hot and cold taps. This designer mixer tap combines hot and cold levers with the spout making it a popular choice. The Della Francesca range represents great value for money without any compromise on quality. It has a high water efficiency Four Star Wels rating and is made from solid DR Brass to last. 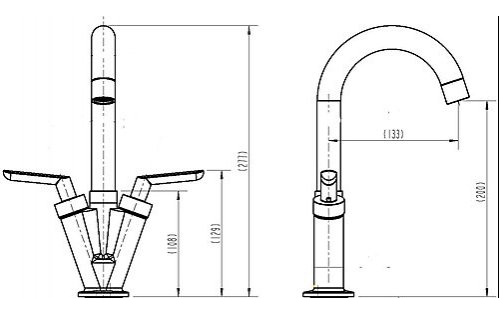 This Alfreda tap from Della Francesca is perfect for the kitchen, laundry or bathroom. Its unique design is for a single bench or sink mounting hole but has separate hot and cold control levers. Some people prefer the simplicity of separate hot and cold lever controls making the Alfreda a popular choice. Separate hot and cold wing styled levers are a unique design that has proven popular with customers that prefer this traditional simplicity. A sinple twist of the hot lever givers you hot water, and a twist of the cold lever gives you cold water. Mix the temperature to your requirement by opening the levers together as required.